Born in Castleford, Yorkshire in 1898. Celebrated as a sculptor, but was strongly influenced in his formative years by painters such as Giotto, Masaccio, Blake, Turner and Picasso, as well as the painter/sculptor Michaelangelo. Attended Leeds School of Art from 1919-21. In 1921 Moore won a Royal Exhibition Scholarship to study sculpture at the Royal College of Art, London. He taught at the Royal College from 1924-31 and at Chelsea School of Art from 1932-39. He was given his first one-man show in 1928 by the Warren Gallery and in the same year he gained his first public commission - to carve a relief in stone for a façade of the new Underground Building, London. Moore was a member of the Seven and Five Society from 1931 and in 1933 he was invited to join 'Unit One'; a group of seven painters and five sculptors whose members included Edward Burra, Barbara Hepworth, Ben Nicholson and Edward Wadsworth. During the Second World War, as an Official War Artist, he made a series of drawings of people sheltering in the London Underground, as well as studies of miners at the coal-face. In these pictures he frequently used watercolour over wax crayon employed as a resist. In 1946 Moore was given his first overseas retrospective at the Museum of Modern Art in New York. In 1948 he won the International Sculpture Prize at the Venice Biennale. 1948 also saw him begin the bronze family group for the Barclay School of Art, Stevenage which was to be his first life-size bronze. He had a retrospective exhibition at the Tate Gallery, London in 1951 and 1968. In 1952 he began work on the stone Screen and bronze Draped Reclining Figure, both for the Time-Life Building, London. He was First prize winner at the Sao Paulo Biennale, Brazil in 1953. Moore was a Trustee of the National Gallery, London from 1955-74. In 1956 he received a commission for the UNESCO headquarters in Paris. He was given a one-man exhibition at the Forte di Belvedere in Florence in 1972; the first of numerous outdoor exhibitions held in capital cities throughout the world. 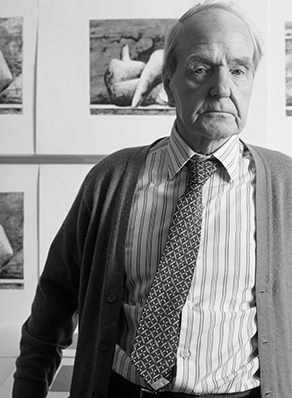 In 1977 he formed the Henry Moore Foundation at Much Hadham in Hertfordshire. In 1978 he made a gift of 36 sculptures to the Tate Gallery, London. In 1986 he was given major retrospectives in Hong Kong and Japan. He was notable throughout his career for his output of graphic art (drawings, watercolours, etchings, lithographs), not necessarily closely related to the development of individual works in sculpture. These unusually for a sculptor, often used colour and often established a complete pictorial setting for figures or for imaginary sculptural objects, in a manner recalling the work of De Chirico or Max Ernst. ( He exhibited in the International Surrealist exhibition in 1936). In 1986 Moore died, aged 88, at Much Hadham where he had lived since the 1940’s.